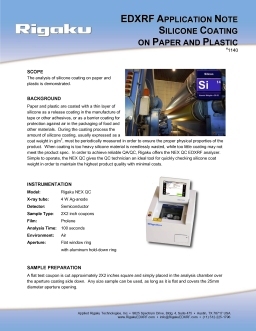 EDXRF | XRF for Silicon on Paper/Plastic - Applied Rigaku Technologies, Inc.
Silicone oil coatings serve applications from mold release to protective barriers. X-ray Fluorescence (XRF), a standard technique across the coatings industry, is used to determine coating weight, thickness and/or composition. Paper and plastic are coated with a thin layer of silicone as a release coating in the manufacture of tape or other adhesives, or as a barrier coating for protection against air in the packaging of food and other materials. During the coating process the amount of silicone coating, usually expressed as a coat weight in g/m², must be periodically measured in order to ensure the proper physical properties of the product. When coating is too heavy silicone material is needlessly wasted, while too little coating may not meet the product specification. 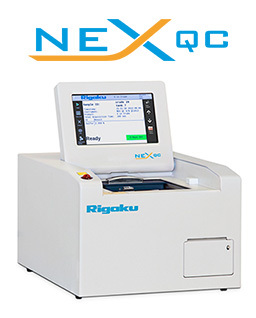 In order to achieve reliable QA/QC, Rigaku offers the NEX QC energy dispersive X-ray fluorescence (EDXRF) analyzer. 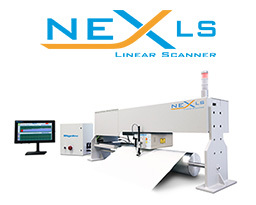 Simple to operate, the NEX QC EDXRF gives the QC technician an ideal tool for quickly checking silicone coat weight in order to maintain the highest product quality with minimal costs.